EYMS win again - well done Dave! 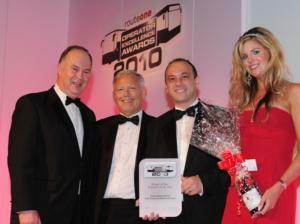 There was another victory for EYMS as the company's Chief Engineer, Dave Heptinstall, was awarded the coveted title of 'Bus Engineer of the Year' at the RouteOne Operator Excellence Awards 2010. The judges commented that their chosen winner, who has almost 25 years' experience in the bus industry, has "a proven track record in improving quality and performance". Dave, who joined EYMS in January 2006, is responsible for 350 vehicles based at eight locations, with a team of 115 engineers and cleaners. The judges were impressed with what he has achieved, including improving the first time MOT pass rate, reducing lost mileage to a constant 0.06%, project managing five fuel tank upgrades, instigating a computerised maintenance system and implementing an apprentice training scheme. Dave Heptinstall said: "It's very satisfying to be recognised by some of the most experienced figures in the bus industry, but without the backing of Peter Shipp, the chairman of EYMS, and the support of my engineering team none of this would be possible so I would like to thank all of these people". Dave Heptinstall (third from left) accepting his award. Want to keep up-to-date with EYMS news? Sign up to our E-Newsletter on our homepage or follow us on Twitter at www.Twitter.com/EYBuses.